According to the ancient and time-tested theories of Buddhist psychology, we have an inalienable right to be happy. Yet we have very little understanding of what actually makes us happy. We look for happiness in all the wrong places — outside of our own consciousness. Contrary to what we might think, our happiness is not determined by whether we have a large house or a tent, a BMW or a moped, abundant wealth or very little money, or even whether we’re married or single. Howard Hughes was extremely wealthy but was also, seemingly, a pathetically unhappy man. On the other hand, Mother Teresa seemed pretty happy living on very little, helping the destitute and dying in Calcutta. Of course, certain conditions, such as living in freedom or poverty, can have a bearing on our well-being. But they do not determine our ability to attain ongoing, stable, enduring happiness. This can only be achieved with a balanced mind. Problems arise from a misperception of reality. We misapprehend our self — our identity and personality — and we misapprehend the rest of reality, whether it’s other people, cars, houses, or trees. As Anais Nin says, “We don’t see things as they are. We see things as we are.” We are constantly coating what we perceive with our own interpretations, projections, judgments, and past experiences. However, if I do not experience things as they truly are, then my reactions to those things will be in error. This is a simple way of explaining how problems arise. The problem is not in the problem; it’s in the misperception. So, what are we to do? The only long-term solution, is to get ahold of this wild mind that flirts around from emotion to emotion like a hummingbird flying from flower to flower. To get ahold of the mind is to train the mind. If we are overweight, we don’t become thin just by recognizing that we’re overweight. We have to retrain ourselves in the way we deal with eating. And, so, it is the same with our untamed, untrained mind and its disturbing emotions. Success demands a slow, consistent application of mind training techniques such as contemplation, mindfulness, discriminating wisdom, and self-care. No one can do it for us, but even a little effort will pay off. Step One is to realize we have a choice to take control of our mind and, thus, control of our happiness. In other words, we can be conscious, mindful, and aware. While this awareness is a choice, it is an unexercised mental muscle that needs constant retraining. Step Two is to settle the mind, now. In brief, just connect with your breath. Gently close your eyes and with alertness watch the inhalation and exhalation through the nostrils or the rising and falling of your stomach. Watch it like a swan floating across a pond. Count each inhalation and exhalation as one breath. Count through five and then backward to one. Relax with focus. Step Three. 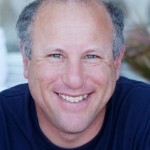 With the mind gently focused on the breath, become aware of what emotion is arising. To keep it simple, just acknowledge one of the three primary emotions: (1) agitation or anxiety, (2) longing, wanting, or desiring, (3) confusion, dullness, or ignorance. Just acknowledge the emotion without getting involved. In Step Four, allow the emotion to dissolve into space. Emotions aren’t static. They are moving phenomena, so don’t get in the way of allowing an emotion to evaporate. Typically, we freeze this movement like a moving waterfall freezes in the winter. Just let it naturally dissolve with a sense of gentle control. Your control here is merely watching what really is happening and letting go. Control by not controlling, not holding. The emotion just arises, abides, and falls away. It is odd that we can describe our hands or our face but if we’re asked to describe our mind we can only offer vague, nebulous descriptions. That’s because, not examining the mind, we don’t know the mind. Knowing how our mind really functions is the first step to mental balance and health and, yes, greater happiness. We need to become explorers – curious about our idea of self, our mind, our emotions, how they function and how we can master them. As such, we’ll seek the knowledge, contemplation, and wisdom to become our own best therapist. Our discoveries become the pathway to solving our problems and revealing a happier and healthier way of being. 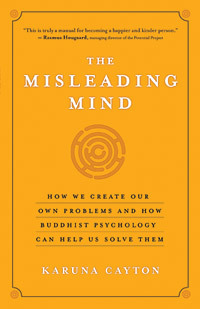 Karuna Cayton, psychotherapist and author of “The Misleading Mind”, spent twelve years working with Tibetan refugees in Nepal and studying with Buddhist masters. 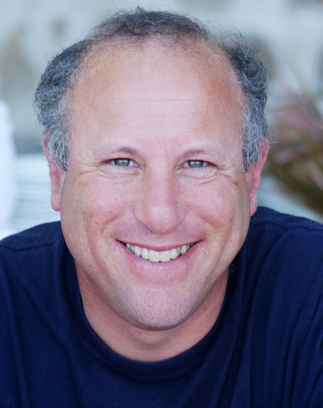 His Karuna Group practice applies Buddhist psychology to individual and organizational clients. He lives in Northern California. Visit him online at www.thekarunagroup.com. 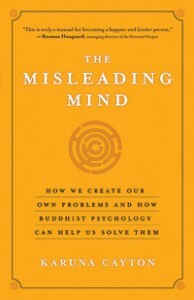 Based on the book “The Misleading Mind: How We Create Our Own Problems and How Buddhist Psychology Can Help Us Solve Them” 2012 by Karuna Cayton. Printed with permission from New World Library.